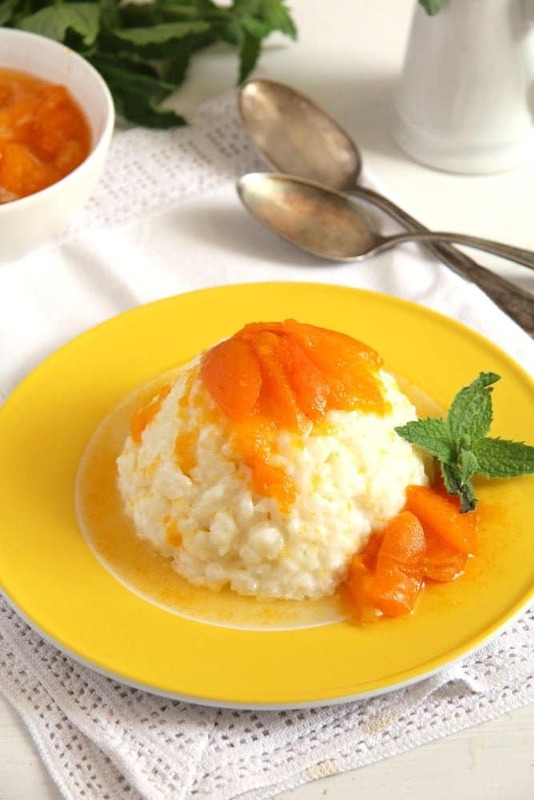 Soft and delicious rice pudding topped with a tangy and easy to make apricot sauce. 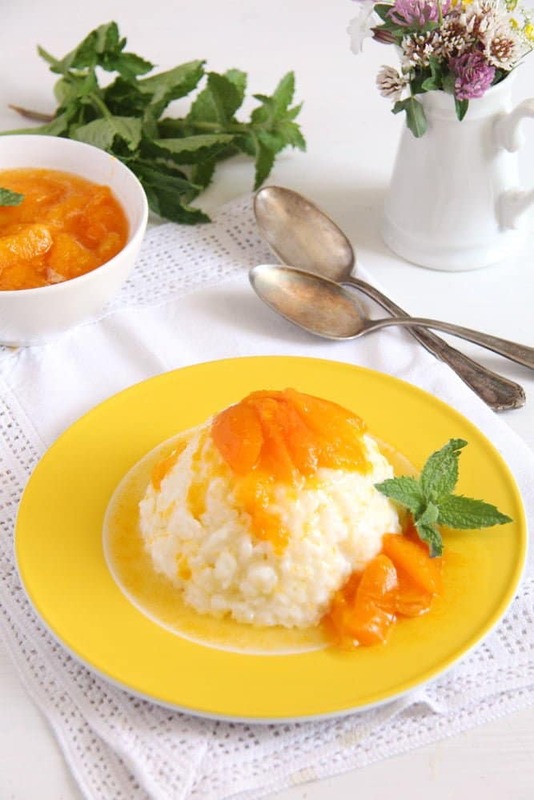 Who doesn’t like a nice, creamy, luscious rice pudding? 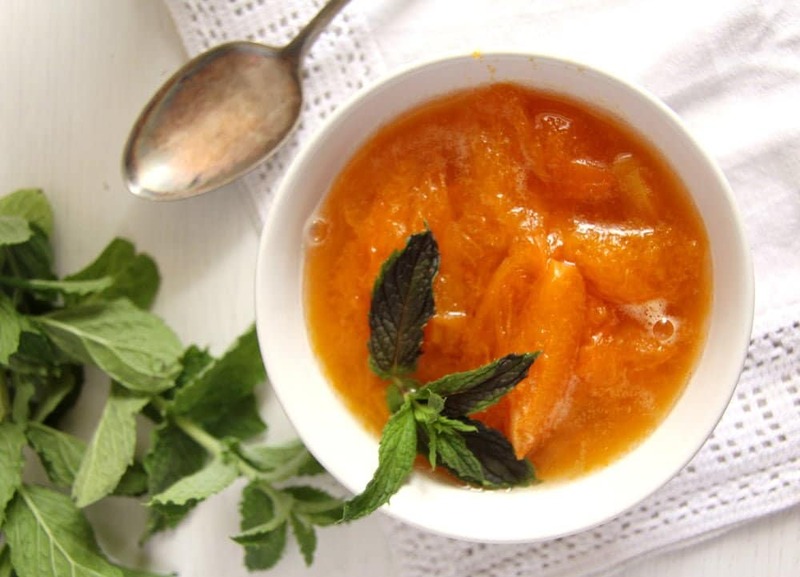 I really can’t think of one person who would refuse that… And then everything topped with this bright colored, tangy and sweet apricot sauce. Love it! I could have it every week. 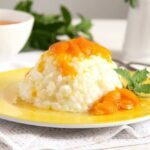 Well, I don’t manage to make it quite every week, there are so many other things I like to cook all the time that even the classics get neglected sometimes, but I could say that we have rice pudding about once a month. Even if I forget about it for a bit longer sometimes, I can be sure that at some point or another one of my kids would ask about it: “Mama, when are you making rice pudding again? This evening? Tomorrow?” And I never say no, I might say no to pizza or a calorie-loaded pasta casserole from time to time, but I never manage to say no to rice pudding. 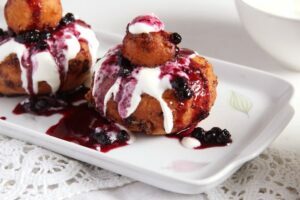 It used to be one of my favorite sweet dishes as a kid as well and I remember asking my grandmother so often to make it again, but most times she wouldn’t. When she did, I was beyond happy. The reason she didn’t want to make it is that she didn’t make anything with milk, she never drank milk or cooked with milk and overcoming her aversion was not always easy (she would not eat it anyway, but I think that even buying and working with milk tormented her). And then, when she did consent to make some kind of pudding with milk, it would have probably rather been the semolina pudding. 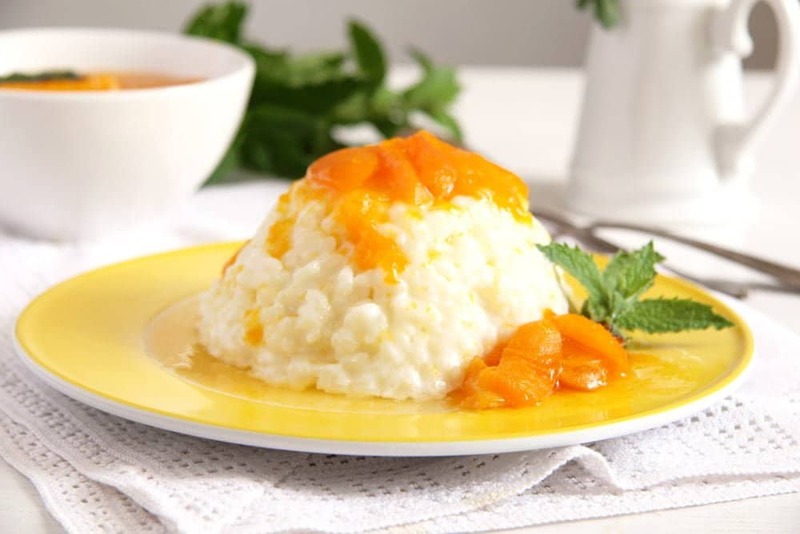 Unlike rice pudding, which needs about half an hour of your attention, semolina is ready in about 5 minutes… So it was semolina I was getting, at least 80 % of the times I asked for rice pudding. And I was always so disappointed… This might be the reason I don’t make semolina pudding myself these days, although I cannot say I don’t like it at all. But it is just not rice pudding, isn’t it? This delicious Blueberry Sauce has been our favorite topping for rice pudding for years. When we were out of that we usually had these preserved cherries turned into a compote or this Blackcurrant Refrigerator Jam or something similar. But recently I discovered this wonderfully tangy Apricot Sauce and it has already become one of my favorites. 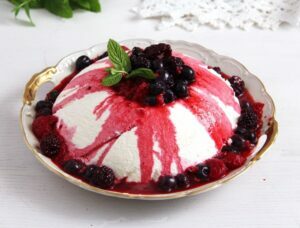 I like its freshness, its tanginess which fits so well the sweetness and creaminess of the rice pudding. And it is such an easy and quick recipe! During the apricot season I make it with fresh apricots, but I have tried it with canned apricots as well, just to see how it works and it is delicious as well. A bit less tangy as the canned apricots are usually already sweetened, but still delicious. There is only one thing to remember when making the sauce with canned apricots. While you will need to cook the fresh apricots with sugar and water for 3 minutes, don’t cook the canned apricots, they are already soft. Cook the water and the less sugar for 3 minutes and then add the sliced apricots. Or you could completely replace the water and sugar with the syrup from the can. So easy! Concerning the rice I use, in Germany we have this special rice for rice pudding, sold under the name of Milchreis (milk rice). It is basically just a short-grain rice, so you can use whatever short-grain rice you have. Make sure to read the package’s instructions just to make sure you cook the rice long enough or don’t overcook it. When I am out of short-grain rice I make the pudding with regular long-grain rice as well and we like that just as much, I don’t think anybody ever spotted the difference. 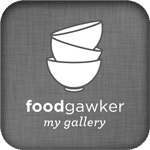 I filled the hot rice in small bowls, let it get cold and then turned the rice onto plates. This way it looks nice, but that is just show, so to say, you don’t have to do it. The rice tastes equally delicious eaten directly from the bowl and that way you could enjoy it warm as well. And regarding the apricot sauce. This amount will be enough for four serving of Rice Pudding with Apricot Sauce. 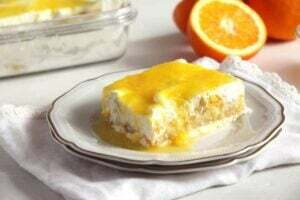 However, if you have leftovers or make just a bit more of it, you could use those leftovers to make another delicious dessert, which I will post in a few days. If making the sauce with canned apricots don't cook the canned apricots, they are already soft. Cook the water and less sugar (to taste) for 3 minutes and then add the sliced apricots. Or you could completely replace the water and sugar with the syrup from the can, which you will thicken with the corn starch as well. Place the rice, milk, sugar and salt in a pot. Cover and bring to a boil, lower the heat and cook slowly for about 25 minutes or according to the package's instructions, some other rice sorts might need a longer cooking time. Stir often making sure that the rice doesn't catch at the bottom of the pan. After the cooking time is over, let the rice stand covered for another 10-15 minutes or until all the milk has been absorbed by the rice. If you wish you can give the rice to small bowls, let it get cold and then turn it onto plates. If not, you can enjoy it either warm or cold topped with the apricot sauce. In the meantime make the apricot sauce. Halve the apricots and cut each half into 2 or 3 slices. 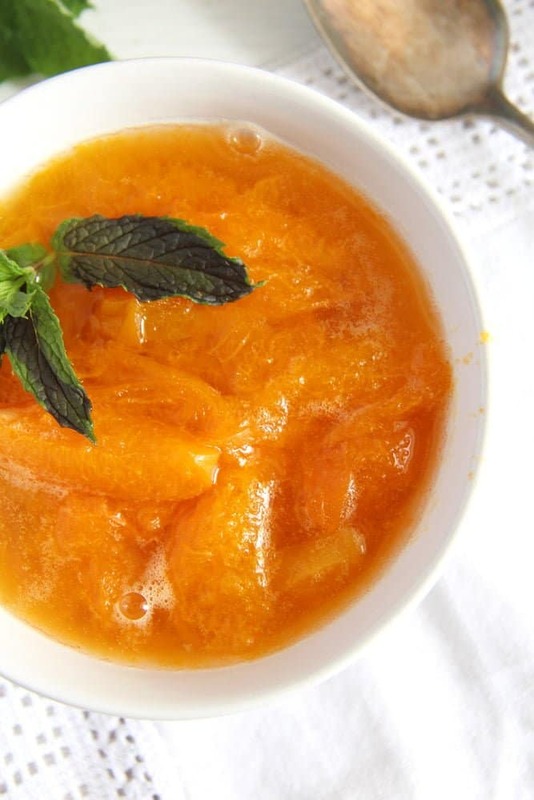 Place the sugar, water and apricots in a small sauce pan and bring to a boil. Cook for 3 minutes. In a small bowl whisk together the corn starch with 1 or 2 tablespoons cold water. Whisk this mixture into the sauce and cook for another minute or so or until the sauce thickens slightly. Serve warm or cold with the rice. I love that you paired the rice with apricots! Beautiful colour and flavour, Adina. I love the simplicity of this recipe. And wow.. the apricot sauce looks delightful (perfectly in season now). I am coming over from Rosa’s blog and I am very pleased to have discovered you. So many fab recipes. Ciao! I like apricots with rice pudding. I don’t make it very often though. I love it when things come together. Tomorrow is my husband’s birthday and I wanted to make something different for dessert. He loves rice and adores apricots so this is perfect. I’ve put up 5 pints of apricot jam today and still have 10 pounds on the counter. Great timing! Thank you!